In the beginning of August, a relatively small but thoroughly dried and highly combustible woodpile was planted into the smoldering bonfire of the “trade” war between the world’s two leading powers. 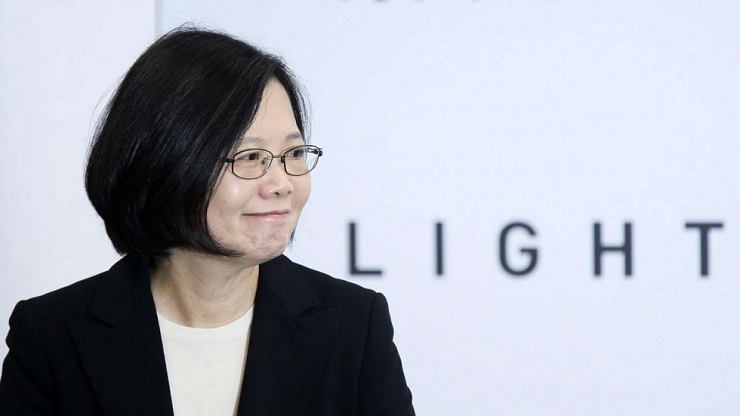 The matter in question is the visit of Taiwanese President Tsai Ing-wen to Los Angeles. The format of her stay in this major US West Coast city raises many questions: where did she go, with whom did she meet and speak? Officially, Ms.Tsai’s two-day stay in Los Angeles was a stopover made in the course of her trip outside Taiwan. The objective was to conduct a working visit to Paraguay and Belize, two of the 18 countries that continue maintaining official diplomatic relations with Taiwan. But in the author’s opinion, the real motive seems to be exactly the opposite. The invitations to visit these Latin American countries were only a pretext for a de facto visit to the United States. Of course, there’s always a “rational explanation”. Both of these countries are located far from Taiwan, which makes it necessary to stop over and have a good meal at a local restaurant. So why not take this chance to meet with representatives of the Taiwanese American community and chat with a few American politicians and congressmen? However, why would the official representative of the Foreign Ministry of China, just two weeks prior to the trip in question, state, “Taiwan is an integral part of China. We are strongly opposed to any attempts that would lead to the emergence of ‘two Chinas’ or an ‘independent Taiwan’ on the international arena.” But after all, Ms. Tsai didn’t make any statement in the US Congress, nor did she meet with the President of the United States. In reality, both participants of this US-Taiwanese game are “imperceptibly and slowly” (as Rossini’s famous aria puts it) creating a troublesome situation for Beijing. The latter has more and more reason to distrust official Washington in its assurances of respecting the “one-China policy” Most recently, these were repeated by State Department Spokesperson Heather Nauert who explained the “occasional transits of the Taiwanese authorities through the United States” with reasons of comfort and safety. It’s worth remembering that a year and a half ago, Ms. Tsai already used a similar “comfort-and-safety” pretext to visit the United States: “on the way” to four other Latin American countries, she stopped in Houston. While there, she had a private meeting with Senator Ted Cruz, a participant in the 2016 presidential race. But today, we can see an evident difference both in the “quality” and “quantity” of the previously proven method. The first thing noted by commentators was Tsai Ing-wen’s “defiant publicity” tone in Los Angeles. There’s no doubt as to whom the words were addressed, and, judging by the preliminary statement of the Chinese Foreign Ministry, something similar was expected in Beijing. Cory Gardner, Chairman of the Senate Foreign Relations Subcommittee on East Asia and the Pacific, prior to his meeting with Tsai Ing-wen expressed the hope that “perhaps in the next decade,” the President of Taiwan will speak at a joint meeting of both houses of Congress. He added, however, that official contacts are likely to start at the ministerial level. Among some notable moments of the high-level guest’s “stopover” in the United States was the joyful welcome accorded her by a crowd of Taiwanese-Americans at the Ronald Reagan Library. The visit ended with a banquet organized in a local 85 Degrees Celsius Bakery Café, part of an international restaurant chain headquartered in Taiwan. The event, de facto hosted by Ms. Tsai, was attended by Republican Congressman Ed Royce and Democratic Congresswoman Judy Chu. In reaction to this, China clearly hinted that the 85 Cafe chain on “mainland” territory may suffer significantly as a consequence. Commentators note that changes to the quality of this “stopover” in the United States is due to the adoption of the H.R 535-Taiwan Travel Act (TTA) in the spring of this year. Its main principles and possible consequences for US-Chinese relations have been previously discussed. The TTA incorporated contacts between representatives of the US and Taiwanese authorities into a legal framework. For obvious reasons, this caused a sharply negative reaction in China. The adoption of this act smoothly fits into the strategy to “imperceptibly and slowly” accord US-Taiwan relations an intergovernmental dimension. The same strategy is reflected in the construction and ceremonial commissioning (on June 12, 2018) of a new complex of buildings of the so-called American Institute in Taiwan (AIT). Construction costs have been rated at about 260 million dollars. Since Washington ceased official diplomatic relations with Taipei in 1979, all this time the AIT has been performing the former functions of the US Embassy. Albeit, as a “non-profit organization”. Another symbolic aspect is reflected in information received this July by the Taiwanese media from sources in the US Defense Ministry. These reports state that starting in September of this year, security of the AIT will be assigned to US Marine Corps soldiers. As the Marine Corps normally fulfill these obligations in regard to US . embassies located abroad, China’s reaction is quite understandable. In conclusion, we may note the general negative reaction caused both internationally and in US-Chinese relations by the (de facto) visit of the President of Taiwan to the United States. Today, this negativity is mainly centered around the fields of trade and economics. The essence of the problem was most succinctly expressed by the Managing Director of the IMF Christine Lagarde. Her article was published on the eve of the ministerial meeting of the G20 held in Buenos Aires in late July. The authoritative international financier and politician called on the world to stop imposing mutual trade barriers based on the “eye for an eye” principle. At the same time, it was clearly implied that the escalating conflict could go beyond just trade and economic relations. Translated into everyday language, the message it conveyed to all the major world trade players (not only the USA and China) sounded quite simple: “Fools! Stop before it’s too late.” In fact, this universal slogan is equally applicable at all critical stages of human history. Unfortunately, it’s almost never heeded. Something similar can be said today, when, for no apparent reason, thrill-seekers keep pulling at the mustache of the great Chinese dragon.